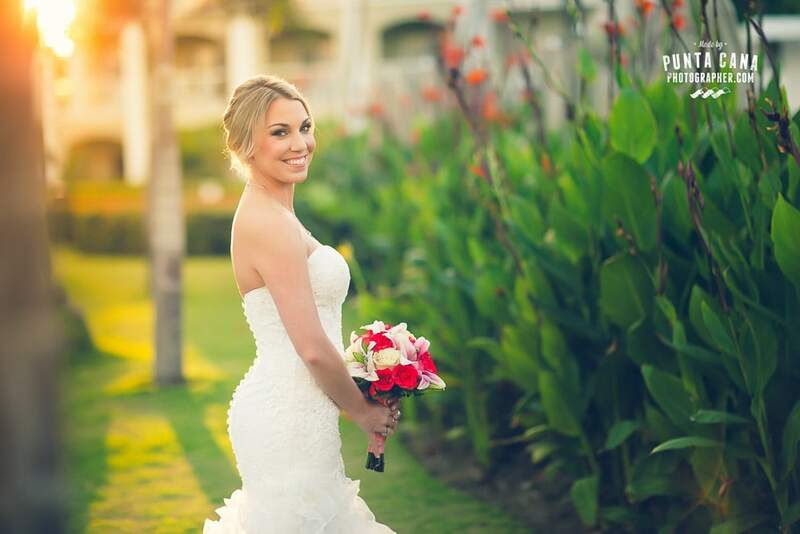 Some of the brides that contact us for their Punta Cana Wedding are lost. The majority of them know that they want to get married in the Dominican Republic, but they don’t even know where to start. And I always point them to this wedding checklist. It is by far the easiest way I’ve found to plan and organise a destination wedding in Punta Cana from start to finish. I’m not saying it’s perfect. I’m saying it’s useful. That being said, I keep coming back to this post to add a thing or two, to help out more people and add the latest details that you should know about this beautiful yet complicated piece of paradise. Let’s get our hands dirty and begin. Read only the RED titles and the Bulleted Lists if you want to learn the basics. Read the BLACK titles and every paragraph if you want an in-depth explanation of how things work in Punta Cana. Do you want to read this later? Download a PDF version for free. Read it on your laptop, smartphone or iPad. Download a file with a shorter version of this guide, it's free. 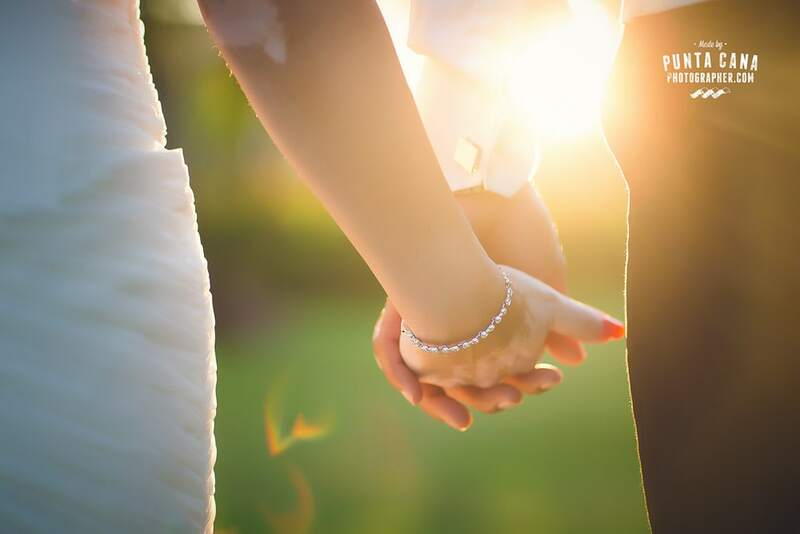 You got engaged… now what? It is key that you set on a realistic budget of what you have saved and can spend, what you can save in the next months, and what you can collect from your parents or whoever is helping you to achieve this destination wedding thing that you got in your head. Prioritize: What parts of the wedding are more important to you, and in what parts you don’t want to splurge? If you feel like saving, do it. If you have an idea of what you can spend, it’s a good time to decide on Venues or Resorts. If you’ve done this already, skip the next paragraphs. Do you have enough budget? You may want to pay these places a visit before deciding on any of them. This would also be a great opportunity to meet your future wedding coordinator. Wedding Venues in Punta Cana are a dream come true. I’m not talking about resorts, but about places like Caletón, Juanillo, Playa Blanca, Punta Espada, La Cana Golf, amongst a few others. These are not only a LOT more intimate and beautiful than most resorts but also a lot more expensive. 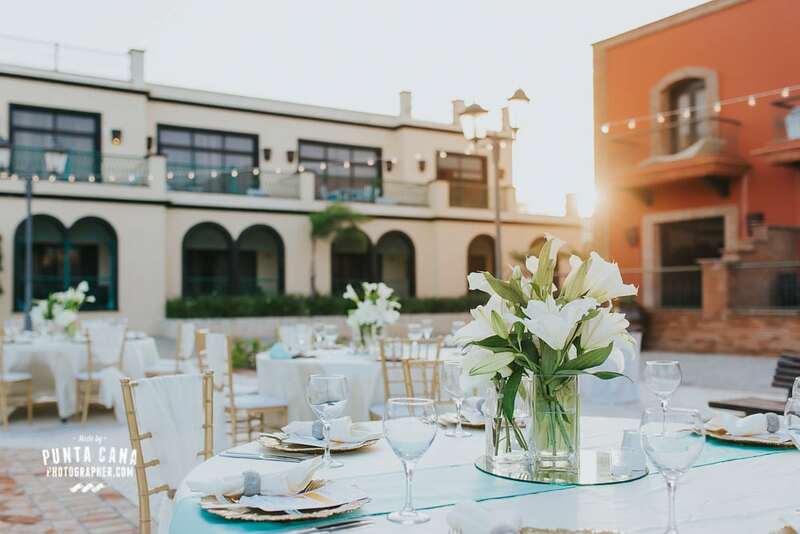 If you are looking at Wedding Venues that are more affordable, options are Kukua Beach Club, Jellyfish Restaurant, Huracan Cafe, La Barcaza Wedding Boat, and Sanael Caribbean Boat just to mention some of them. I can recommend these venues any day without even thinking about it. Their weddings turn out amazing every-single-time. All inclusive resorts are a great option too, but not all of them. When brides ask me about the best resorts to get married, I never know what to say. It REALLY depends on the kind of person that you are. If you don’t mind seeing 5 or 6 weddings next to yours on your wedding day, I have to say they do an amazing-fantastic-awesome job at Hard Rock Punta Cana. That being said, I’m not that kind of person myself. I like intimate weddings by the beach without a lot of people around. If you don’t mind getting married at a resort like this, some of the resorts with the most weddings in the area are Hard Rock, Majestic Colonial, Majestic Elegance, Dreams Punta Cana, Now Larimar, Barcelo Palace Deluxe, just to name a few. If you are looking for smaller or different options: Dreams Palm Beach, Paradisus Palma Real, Iberostar Grand, AlSol Luxury Village, AlSol Tiara are some good options to consider. Do I need a Wedding Planner for a Wedding in Punta Cana? Yes, but you probably don’t have to hire one by yourself. Most resorts and wedding venues will provide a wedding coordinator for your wedding day. If you want to hire a professional that you trust, you can do this arrangement with some resorts, while others will have restrictions for this. Make sure that you ask about this before doing any kind of payment if you want to use your own professional coordinator. If you get married in an outside venue, there are a few places that don’t have a designated planner and you can hire anyone that you like. There are a few professionals that I can recommend, like Nati Roldan, Bego Celaya, Mayte Marie, Jennifer Collado, amongst a few others. Create a Guest-List and try to be realistic. Not everybody will be able to travel for your wedding day. Some people won’t have enough money, while others will be working at the time. According to statistics, about 50% of the people that you invite will attend a destination wedding. Other sources mention that about 30 to 40% of your guests will be unable to make the trip. Either case, if you want to have 40 people at your wedding, you should invite about 80-100 in total. Make sure that your closer relatives (parents, siblings) will be able to attend before you set on a date. Choose wisely, trying to focus on your needs and your most important family members. If you can afford it, choose a date based on the time of the year that the weather will be good as well. When is it good to plan a wedding in Punta Cana? This is a tricky one. Punta Cana weather is pretty good all year round. But there are better times to get married and better times to stay in bed on a rainy day. I think statistics are always better than my own memory, but there are a few things I want to say about this: Hurricane season starts in June but by no means you should avoid visiting us in June. June is beautiful. It’s also extremely hot. The hurricane season in Punta Cana starts in June and finishes in November. June and July are fantastic to visit if you don’t mind sweating non-stop all throughout the day. These are by far the warmest months, and the humidity is awful. We get plenty of weddings in these months and none of them are disappointed. The ocean looks at it’s best and the beach is prettier than ever. Other great months are March and April when it’s not so hot and the weather tends to be really good. January and February are a safe bet, but the ocean never gets as warm as you can feel it in the summer. If you can, I would avoid September and October because it’s our bad weather season. If there’s a hurricane passing by, you’ll feel the strong winds in September more than ever. August and December are always a matter of luck to me, but again.. this is my personal opinion. I didn’t mention May because I have a strong opinion about May. 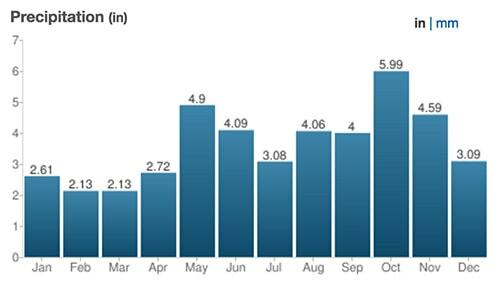 It’s our busiest month of the year, and it’s also the month with more rain. It usually rains for a couple hours every night, and sometimes during the day. There are a lot of weddings that have their receptions indoor because of this. Book the professionals that are going to work on your wedding day. 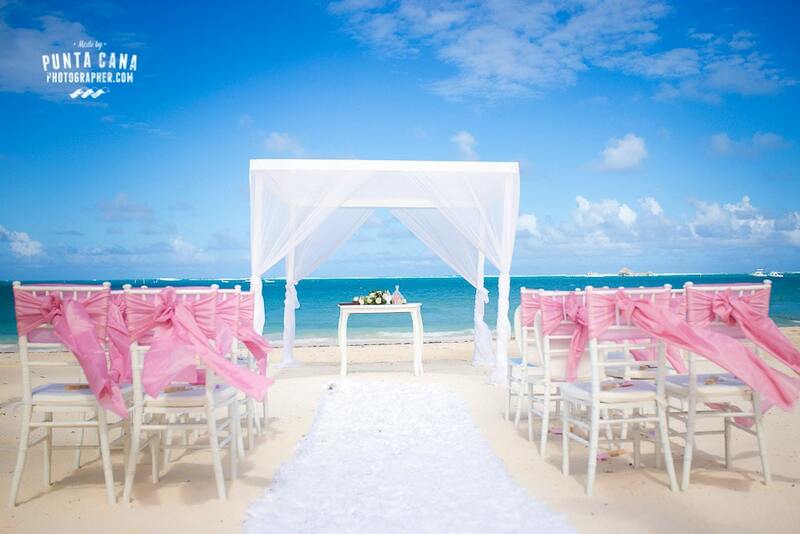 If you want an officiant to perform your ceremony, there are some great options in Punta Cana to consider. Jehison Cabrera, Rick York, Marcos Parucker and a few others are easy to get in touch with. Most of the times you do NOT need an officiant because the Wedding Coordinators do this job as well. My personal opinion: If you want something a little more special, these guys do a great job. Some wedding planners are great, and some are pretty bad at this job (misspelling English words when they read, doing the ceremony too fast due to nerves, and things like that). Jehison Cabrera is the person I would hire without hesitation. Book a Photographer. Someone whom you trust, and whose portfolio matches what you expect from your wedding day. As a wedding photographer myself, I’d love to capture your wedding day if you are interested in working with us. If you feel like looking into other options, a simple Google search will do the trick. Make sure you read the reviews, the good and the bad ones. We have some horror stories in Punta Cana like everywhere else. Book a Videographer. The difference between photographers and videographers is that most of the time you’ll be interacting with the first one. The videographer will be recording most actions without a lot of input in most cases. There are some exceptions and some videographers who like to coordinate the whole wedding. Feel free to hire the one that matches your needs. We offer videography as well, and while our videographer will be absolutely silent throughout the day, he knows exactly what looks best on our Wedding Videos. Book a Makeup artist. This is not mandatory because most resorts offer on-site makeup artists, but my experience can tell you that the professionals working outside resorts do a better job in general. Some great options are Anna Nuet, Magda Riccardi, Melanie Gabriele and Krystie Ann amongst a few others. We wrote a post about make-up artists in Punta Cana as well. Book a Wedding DJ if you want to use your own, or if your venue doesn’t provide one. A professional DJ can make a huge difference when it’s time to get your guests on the dance floor. Some of the best in the area are GCStar, Mannia, Eventos FJ and Friends Events. Book a Cake Baker. This is not necessary if you get married at a resort, but it might be if you get married at an outside venue. In Punta Cana there are some great bakers: Ana from Cake Studio Bavaro is our top pick. When should I book a Photographer for a Destination Wedding? We get bookings a LONG time before the wedding dates happen. If you want good photographers or videographers, chances are they won’t be available a month before your wedding. They might be, but do you want to take the risk? We also increase our prices every year or so. Cameras get more expensive. Computers get more expensive. Taxes are higher, and services improve. We might have started with a basic setup many years ago, but things got better and more expensive. Booking months ahead will save you from price increases as well as doing last-minute bookings for the person who’s available that day. Send out Save the Dates. Remember to include your Website on them. Set a date for your guests to RSVP. Where can I create a Wedding Website for Free? How far in advance should my guests RSVP? The deadline for your guests depends on your needs. If you need to start booking rooms together because you’re saving money, then ask for an earlier deadline. Most destination wedding couples ask their guests to RSVP at least 2 months before the wedding date. Your guests are responsible for their travel, but you can make their life easier by helping them getting discounts or things like that if your resort allows any of this. Which kind of wedding dress is better for the beach? Unlike Pinterest told you, those big puffy fairytale dresses are not comfortable at all. If you want to feel comfy and a little bit cooler, wearing lightweight fabrics is the best way to do it. Airy fabrics like chiffon are a lot easier to wear on the sand and on your first dance when you need to actually move your feet. Also if you are dress shopping you should know that pure white dresses look blueish against the blue sky and blue ocean. 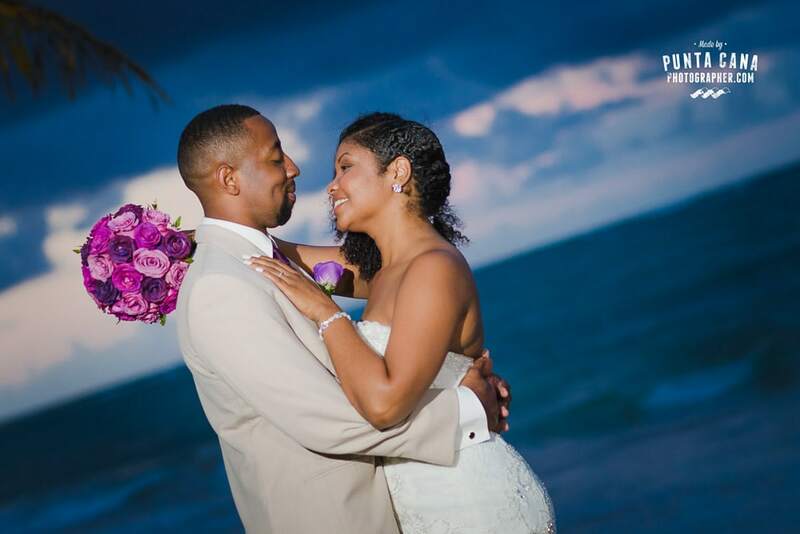 A little hint of warm tones will make your wedding photos look a lot better against the turquoise water of Punta Cana. We also wrote a post about choosing the right Wedding Dress for the shape of your body. Should I wear a veil to my destination wedding? As photographers, we love to photograph brides with big, long, detailed and flowy veils. The getting ready photos turn out better, and the beach photoshoot look better as well. Now being honest, walking down the aisle and standing on a windy beach trying to read your vows with a veil pulling from your head isn’t the easiest thing to do. The best options are: using a simple veil that it’s not too long, putting a long veil on for the photoshoot, or using something simpler and much more recommended like a flower crown or a birdcage veil. This options will make you feel more comfortable and relaxed as you say I do. Designate your Bridal Party. Bridesmaids, Groomsmen, ring bearer and flower girls. Start looking for Jewelry, shoes, garter, lingerie, accessories, and other things that you may need. Create a gift registry (if using one). Verify all the necessary requirements for a wedding in Punta Cana. Is it Legal? Is it Symbolic? Where should I buy my jewelry and wedding accessories? If you spent some time online doing research for your wedding, you probably found out about Etsy. Etsy it’s not the cheapest store you’ll find online, but it’s definitely the one with the best-curated products for sale. The kind of stuff that you’ll find on Etsy it’s made of better quality than its competitors almost every single time. It’s also a lot more expensive if you compare Chinese-made items. From the shipping costs to the better materials, you will see a difference. That being said, we strongly recommend that you get quality products from this website instead of the low-quality copies that can be found elsewhere. The other online stores in which you can find great products, accessories and details for your wedding include Amazon, eBay, and independent shops like WeddingStar or TheWeddingOutlet. If you don’t know what to look for, you can get started with basics like barefoot sandals (foot jewelry), handmade garter, bridesmaids kits, destination wedding set, welcome bags, thank you cards, save the dates, or any other ideas that you can think of. How many bridesmaids and groomsmen do people pick? Well, this is hard to answer. I don’t know why I even asked this question! In our weddings, we had everything from no bridal party at all to a huge bridal party of 24 people. As everything in life, avoid being extreme. Your wedding photos look a lot better with somewhere between 6 to 12 people in total. Yes, you can have 30 people in your bridal party or none and you’d still be fine. What are the necessary requirements for my wedding in Punta Cana? It really depends on what kind of ceremony you are planning. Most people decide to get married at home, and then perform a symbolic ceremony in the Dominican republic. For a Symbolic Ceremony, you’ll need your love to one another! The Couples will bring all the original documents with them to the hotel and those won’t be given back to couples since the Judge will keep them for their records. Please do not forget to double check this information with your wedding coordinator as some resorts or venues may ask for something else. Double check your passport’s expiry date. Make arrangements for pre or post-wedding activities. Book your flights! Make sure that your closer family does this as well and feel free to encourage your guests to do the same. Pick your bridal party clothing and make sure they order theirs. You can start booking rooms at your resort. For your guests, it’s easier to book a room block so they are closer to each other if possible. Share your ideas with your wedding planner to create your wedding vision. Themes, color palette, decor, details… try to include pictures of what you would like to do and find out if your budget allows this. Pinterest boards can be a great way to do this. What do I need to visit the Dominican Republic? Not much! Luckily almost everyone can visit DR without any restrictions. You only have to pay for a Tourist Card at your entrance, which costs 10 US Dollars. Make sure that your passport is valid, as we’ve had some crazy stories in the past of close family members who couldn’t make the trip because of paperwork issues back home. What activities can I do in Punta Cana? There are tons of options in here! From parasailing to golfing, and everything in between. What people enjoy the most are activities like party boats after the wedding day, or golfing and fishing for the guys. Punta Cana has a lot to offer and it all depends on what you are interested in. If you feel like an adventurer, the buggies excursion to Macao beach is probably a great option. They also take you to el Hoyo Azul (the Blue Hole) to freshen up afterwards. Punta Cana boasts some of the most exclusive golf courses in the Caribbean. Corales, La Cana, Punta Espada, Cocotal, Punta Blanca and Hard Rock are some of the options out there. Prices vary a lot and you should find the one that fits your needs. If you want to dig deeper into this, we wrote a whole post about the best activities in Punta Cana for your wedding week. Plan side events like Rehearsal Dinner, welcome party, or similar events with your wedding coordinator. Pick the songs for your wedding day. Walking down the aisle, just married, first dances, bouquet toss, garter removal, and a few other events require a special song. If you don’t feel like choosing some of them, your DJ or MC can help you out. Confirm details with your vendors. If you didn’t have some information in the past, now it’s a good time to get in touch with them again. Prepare your seating chart and buy a guestbook for your wedding reception. Do the final touch-ups on your dress. Should I do a rehearsal dinner? As far as I know, this tradition belongs mainly to our brides from the USA or Canada as this is not a tradition in most UK families. Rehearsal dinners are a great opportunity to get both families interacting with each other. This allows them to talk and get to know them better before the wedding day. This celebration takes place a night or two before the wedding date, and it’s a great excuse to enjoy some time together as a single family. If you are worried about not spending enough time with your guests at your reception, this would be a great opportunity to do that, stress-free. Some of our couples decided to include a few shows in their rehearsal dinner instead of doing it at their wedding reception. Some examples are Fireshows, Cartoonist, Cigar Rollers, amongst a few others. If you want to book any of these shows, Vanesa Enciso from HOTS Productions is a great option. Should I create a Seating Chart? This is completely optional. Most destination weddings in Punta Cana have a seating chart to show guests where and whom should they sit with. If you don’t feel like telling your guests what to do, some funny signs like “We found each other, you have to find a seat” or “Pick a seat on either side, you’re loved by both, the Groom and the Bride” will do the trick. When deciding on the reception arrangements, you should know that not every bride and groom have their own sweetheart table. Some of them decide to sit with their bridal party on a different table, while others plan to sit next to their closer families at a round table like everybody else. This is completely optional and you should feel comfortable with your decision. After all, it’s your day. If doing gifts, this is a good time to purchase something special for your fiance. Prepare a timeline for your Wedding Day. This is especially useful if you share it with your photographer and videographer. Other vendors may be interested in this as well, like your makeup artist or your DJ. What should I buy for my fiance for our Wedding Day? I’ve seen it all. Most brides bought him fancy watches, but you don’t have to be one of them. A few brides gave him a little book from their boudoir photoshoot and these gave me the better reactions to photograph. Your groom won’t believe it when he sees you at your best, just for him. That’s a more intimate idea, and it works. If you don’t feel like posing on lingerie for your gift, you can always make him something. Emotional gifts are always a lot better than a simple watch or necklace. If you know that he truly desires something, you can buy that something. If not, think of something special that will touch his heart instead of his pocket. Common gifts to buy are Watches, Necklaces, Sport related stuff (for fans only! ), Wallet, Cufflinks, Flasks. Start packing all your Wedding Items and make sure that everything fits in your luggage. If you don’t want to forget stuff, take some time to do this. Should I do a Hair and Makeup Trial before my Wedding Day? You don’t need to, but it’s highly recommended. If you have the chance to see if you like what you’re getting, doing a trial will be great to do any modifications for your special day. If it’s not an option, it shouldn’t be a problem as the professionals that will do it for your wedding do this every day. Trust them, and explain them clearly what you’re looking for. If you have images to show them what you like, even better. Words can be misunderstood, and if there are any language barriers, it’s even harder. Should I tip the employees working at my Wedding? This answer is very clear, but it is my own opinion and yours can be different. Yes, you should. Employees working at resorts make very little money and make a living out of your tips. If you have someone working hard to make your day even more special, compensate them. A lot of people working at resorts make less than 10 dollars a day. If you give them something, it always helps. Even if it’s one dollar. Tips for your vendors vary depending on your feelings towards them and the kind of job they have. We are professionals that are being paid for our work and we won’t be working harder if you tip us, but for sure we’ll be happier. If you hire resort photographers, videographers, makeup artists or DJs, they are making a very low income even if you pay 3.000 US dollars for their work. They only get a –very- small commission out of it. Yes, you should tip them as well. Arrange a meeting with your wedding planner to finalize details. Inspect ceremony and reception locations. Make sure those fill your expectations. Sometimes you can change them if there were available spots on that day. Hopefully, you won’t need to do this. Do your manicure and pedicure. Yes, we will see your nails in the photos! What should I keep in mind for my Wedding Day? Just a couple of simple things. Remember to arrange the entrance for your vendors to your Wedding Venue or Resort. Your wedding coordinator will take care of this. Designate someone to help you with the dress. Make sure that she’s ready before you are. Have someone clean up your room before your photographer and/or videographer gets there. It’s not easy to take good pictures if we have to clean up the food from your bed. Some things are fixable in Photoshop, while others are almost impossible to do. Have someone clean up your fiance’s room. I can’t stress on this enough. Almost every day we go to a room that looks like a mess. Sometimes it’s easy to fix. Sometimes it’s just a mess. Keep the rings together. It doesn’t matter in which room, but we need to see them together in order to take pictures of them. You can keep your engagement ring in your hand at all times. If you want something to be photographed, make sure that we can see it. It’s always best if you lay out your jewelry and accessories on a table or on the bed. We need to see the things that are hidden in your safe, bag, or luggage. If we can’t see it, there won’t be pictures of it. It’s your Wedding Day in Punta Cana! Keep your flowers in the fridge or in a room with the air conditioning working properly. The heat in Punta Cana shouldn’t affect them before the ceremony. Enjoy as much as you can. This day will go fast. Really fast.